Bank of America is one of the world's largest banks. The bank had $2.11 trillion in assets as of December 2014. It is "one of the country's most extensive branch networks," according to Hoover's, and has been one of the biggest lenders (though its top position suffered in 2012 after billions in mortgage losses). By acquiring Merrill Lynch in 2009, Bank of America became the world's largest brokerage firm. In 2013, Bank of America reported $89,801,000,000 in revenues ("total revenue, net of interest expense"). Access Bank of America's corporate rap sheet compiled and written by Good Jobs First here. NOTE: For information on Bank of America's role in the financial crisis, see the sub-article Bank of America financial crisis. Bank of America has been a corporate funder of the American Legislative Exchange Council (ALEC), and a member of ALEC's Commerce, Insurance and Economic Development Task Force. See ALEC Corporations for more. Bank of America ATMs in Downtown Portland on March 1, 2011 were targeted by climate change activists in the area. Notices were placed on the ATMs which informed customers that the ATMs were "temporarily closed until in invests responsibly in renewable energy." Bank of America was targeted for its financial support and investments in the practice of mountaintop removal. On Friday, May 9th, 2011 two bank branches in downtown Portland, Oregon, one belonging to Bank of America and the other to Wells Fargo, were targeted by approximately 30 activists who showed up to protest the banks' investments in coal projects. Both banks are major lenders to Arch Coal, the second biggest coal company in the United States. Arch Coal was targeted because, along with Ambre Energy, it is responsible for the proposed Millennium Bulk Logistics Longview Terminal near Longview, Washington. Arch Coal also owns the Otter Creek coal mine in Montana, which the company hopes to use as a source of coal to be exported. Protesters assembled by Portland's Reed College entered the banks as mock coal export trains, which they believed will expose Northwest residents to coal dust, diesel fumes and noise pollution if the coal export facility near Longview becomes operational. A multi-car human "coal train" entered the banks and marched around the bank's lobby, temporarily disrupting business inside. Climate activists chanted "Hey hey, B of A: Stop investing in coal today!" And later, "Hey hey, Wells Fargo: You say coal, we say no!" On August 15, 2011 fifteen people were arrested in St. Louis, Missouri while protesting the practices of Bank of America (BoA) and Peabody Energy. Over a hundred people marched in protest of BoA's coal investments and Peabody's coal mining activities. The arrests occurred in a downtown St. Louis intersection that connects Bank of America's regional offices and Peabody's world headquarters. The actions were carried out by Midwest Rising! Convergence, a group associated with Rising Tide North America. NOTE: For additional information on Bank of America's role in the financial crisis, see Bank of America financial crisis. In August 2014, the U.S. Department of Justice (DOJ) announced "a $16.65 billion settlement with Bank of America Corporation -- the largest civil settlement with a single entity in American history." As part of the settlement, the bank "acknowledged that it sold billions of dollars of RMBS without disclosing to investors key facts about the quality of the securitized loans. When the RMBS collapsed, investors, including federally insured financial institutions, suffered billions of dollars in losses. The bank has also conceded that it originated risky mortgage loans and made misrepresentations about the quality of those loans to Fannie Mae, Freddie Mac and the Federal Housing Administration (FHA)." "'At nearly $17 billion, today's resolution with Bank of America is the largest the department has ever reached with a single entity in American history,' said Associate Attorney General West. 'But the significance of this settlement lies not just in its size; this agreement is notable because it achieves real accountability for the American people and helps to rectify the harm caused by Bank of America's conduct through a $7 billion consumer relief package that could benefit hundreds of thousands of Americans still struggling to pull themselves out from under the weight of the financial crisis.'" The New York Times noted that "[t]he actual financial burden for Bank of America, however, may not exceed $12 billion" due to earlier write-downs of mortgages and the bank's ability to deduct some of the payments as business expenses. In his January 13, 2010 testimony before the Financial Crisis Inquiry Commission  Bank of America CEO Brian Moynihan largely blamed the crisis on the excessive leverage of investment banks; the lax regulation of mortgage lenders by state governments; and the political push to expand home ownership among disadvantaged groups. He said the crisis was not necessary, pointing to Bank of America's 2001 decision to stop making subprime loans. He argued combining investment and commercial banking in one company was not a problem. In October 2007, as the bank was declaring losses on its trades in securities backed by subprime mortgages, Moynihan's predecessor Ken Lewis had famously declared: "I've had all of the fun I can stand in investment banking at the moment." Moynihan did not comment on Bank of America's role in packaging subprime loans and turning them into tradable securities, but did state that securitizing loans "reduced the incentives for some lenders to apply as strict credit underwriting standards for securitized loans than they may have applied if they were required to hold and service those loans in portfolio…" He argued nonetheless that securitization is essential to modern financial markets. Moynihan claimed that "No one involved in the housing system – lenders, rating agencies, investors, insurers, regulators or policy makers – foresaw a dramatic and rapid depreciation in home prices." Although derivatives can be used to hedge risk, they can also produce extremely high profits or losses. Regulation of this aspect of the financial industry was central to proposed reforms so that derivative trading could not destabilize the entire economy again. According to Washington Post columnist Harold Myerson, Arkansas Democrat Blanche Lincoln's derivative reform proposal would have meant that "no longer would banks that our government backs up with deposit insurance and access to the Federal Reserve's discounted interest rates be able to put taxpayers on the hook for their speculative bets: They could either continue as derivative-trading casinos or as government insured banks, but not both." The largest US banks lobbied hard to defeat regulation of derivatives. Bank of America and other large derivative traders created a new lobbying organization, the Credit Default Swap Dealers Consortium to shape derivative regulation in a way that would be favorable to the banks. The Consortium was created in November 2008 just one month after a number of its members, including Bank of America, had been bailed out by the government. The New York Times reported that "the banks hired a longtime Washington power broker who previously helped fend off derivatives regulation." His views "played a pivotal role in shaping the debate over derivatives regulation. Bank lobbyists warned that US regulation could drive derivative markets offshore and decrease the availability of the credit needed to get the economy going. Commenting on the $700 bailout the US government had provided to the financial industry through the Troubled Asset Relief Program, Bank of America CEO Brian Moynihan told a Congressional committee that TARP was "an important step to restore confidence in our financial and prevent systemic consequences that would have affected every company and individual in the country." Moynihan professed to the Congressional representatives that "We in the financial services industry are humbled that such support was needed, and grateful that it was provided." However, the aggressive lobbying by Bank of America and the other big banks to stave off regulation of derivatives suggests they were not chastened by the financial crisis. The implicit US government guarantee of TBTF institutions became explicit in October 2008 when Federal Reserve Chair Ben Bernanke and Treasury Secretary Henry Paulson made a public commitment "that the government would act to prevent the failure of any systemically important financial institution." As part of the US government's overall bailout for the banking industry, two bailout programs - the Systemically Significant Failing Institutions Program and the Targeted Investment Program - were created especially for Bank of America, Citibank and AIG because of what administration officials viewed as their critical role in the US economy. The government did not discipline Bank of America and Citigroup in the same way as it did AIG, even though all three institutions were singled out for special treatment from the Treasury because of their significance to the economy. The Congressional Oversight Panel for the financial bailout noted in its December 2009 report that "Treasury required changes in senior management, and diluted the interests of shareholders when the government received a 79.9 percent equity interest in AIG. By contrast, despite providing Bank of America and Citigroup with exceptional assistance, Treasury did not require them to make changes in management. Furthermore, it did not dilute shareholder interests in Bank of America. Treasury has not explained the rationale behind the differences in treatment." Bank of America repaid $45 billion to the US government in December 2009. When Nationsbank took over Bank of America in 1998 – with the combined bank being called Bank of America – it was the largest bank acquisition in US history. The CEO of Bank of America at the time declared "Bigger is indeed better." The combining of these two financial giants was just one example of what the Consumer Education Foundation describes as the "merger mania" that saw 11,500 US banks merge between 1980 and 2005. Bank of America's Too Big To Fail (TBTF) status when it was bailed out by the US government in 2008 was the result of a strategy of aggressive expansion. The financial crisis has produced even bigger financial institutions, with the major banks being the big winners since they were able to buy out their competition and grow even larger. By 2009, Bank of America had grown to the point where its assets represented 16.4 % of US total gross domestic product. In their book, Thirteen Bankers: The Wall Street Takeover and the Next Financial Meltdown, Simon Johnson and James Kwak argue for the break up of the six largest US banks, including Bank of America. They define the "too big to fail" (TBTF) problem in the following way: "Certain financial institutions are so big, or so interconnected, or otherwise so important to the financial system that they cannot be allowed to go into an uncontrolled bankruptcy; defaulting on their obligations will create significant losses for other financial institutions, at a minimum sowing chaos in the markets and potentially triggering a domino effect that causes the entire system to come crashing down." 1) When these institutions are threatened by bankruptcy, the government has to bail them out. Creditors can demand the government compensate them in full for the loans they have made to the bank because they know there is no credible threat that the government will allow it to fail. 2) TBTF institutions have incentives to take big risks for the potential of high rewards with the certainty that they will be bailed out by taxpayers if they run into trouble. Johnson and Kwak point out that "[o]rdinarily, creditors should refuse to lend money to a bank that takes on too much risk; but if creditors believe that the government will protect them against losses, they will not play this supervisory function." 3) TBTF have an unfair competitive advantage because with their implicit government guarantee they can borrow at lower rates than smaller banks. 4) Regulatory efforts to minimize high risk behavior will tend to be blocked due to the political power TBTF banks wield. Johnson and Kwak predict continuing financial crises if the response to the 2008 crisis does not include breaking up TBTF banks. They state: "solutions that depend on smarter, better regulatory supervision and corrective action ignore the political constraints on regulation and the political power of the large banks." While some financial institutions disappeared during the financial crisis, others like Bank of America emerged larger and even more powerful. Returning the big banks to profitability has been a strategy of the Federal Reserve and the Treasury Department to restore financial stability. In August 2007, Bank of America bought a stake in Countrywide Financial Corporation even though, by that date, because of the rapid deterioration in the housing market, no financial institution would loan Countrywide money secured by its mortgage assets. Bank of America made a deal in January 2008 to purchase Countrywide outright. Bank of America CEO Ken Lewis commented at the time that Countrywide was "really -- at the grass-roots level -- a very well-run mortgage company." Two weeks later, Countrywide posted losses of $422 million. Bank of America subsequently dropped the name "Countrywide Home Loans" from the mortgage operation it took over and rebranded its consolidated mortgage division as "Bank of America Home Loans." As part of its rescue of the financial system, the Federal Reserve set up a special investment vehicle named "Maiden Lane LLC" to buy risky assets and remove them from the balance sheets of financial institutions. Included in Maiden Lane's purchases are $618.9 million worth of securities backed by Countrywide mortgages that were granted with little borrower documentation. These mortgages are now rated far below investment grade, and the government is unlikely to recover all of the money it invested in them. In June 2008, the State of Illinois sued Countrywide alleging that it had committed fraud against borrowers through deceptive lending practices. At the same time, California's Attorney General also sued Countrywide, accusing the company of causing thousands of foreclosures and creating "mortgage instruments that did great harm to individuals and the community." Despite the evidence of troubles at Countrywide, Bank of America stuck to its plan to acquire the mortgage lender, and the deal went through in June 2008. To settle the lawsuits with Illinois, California, and eight other states, Countrywide -- as part of Bank of America -- came up with an $8.4 billion loan relief plan for those holding Countrywide mortgages. In June 2010, Bank of America paid $108 million to settle a Federal Trade Commission case that charged Countrywide with having extracted excessive fees out of borrowers facing foreclosure. Bank of America paid $600 million and Countrywide's auditor KPMG paid another $24 million in August 2010 to settle shareholder claims that Countrywide had concealed the riskiness of its lending standards. New problems stemming from its Countrywide acquisition have plagued Bank of America. In June 2010, the State of Illinois sued Countrywide again, this time over racial discrimination in its lending practices. A state study concluded that minorities were charged more in fees and were steered towards subprime loans more often than white borrowers in similar situations. State Attorney General Lisa Madigan stated when she launched the suit: "Countrywide's illegal discriminatory lending practices destroyed the wealth and dreams of thousands of African American and Latino homeowners. Bank of America needs to be held accountable by taking financial responsibility for cleaning up the devastation of the predatory company that it chose to take over." The case was resolved in 2012 when the U.S. Department of Justice reached a $335 million settlement with Bank of America over "allegations that its Countrywide Financial unit discriminated against black and Hispanic borrowers during the housing boom." According to The New York Times, DoJ investigators "concluded that Countrywide loan officers and brokers charged higher fees and rates to more than 200,000 minority borrowers across the country than to white borrowers who posed the same credit risk. Countrywide also steered more than 10,000 minority borrowers into costly subprime mortgages when white borrowers with similar credit profiles received regular loans." When the scale of Merrill Lynch's losses became known, Bank of America was able to convince the Treasury Department to provide an additional $20 billion in bailout funds for its takeover of Merrill Lynch to proceed. Yet weeks before the deal went through Merrill had given out $3.6 billion in bonuses ahead of the normal schedule, with four top executives alone getting $121 million. New York Attorney General Andrew Cuomo has said that "One disturbing question that must be answered is whether Merrill Lynch and Bank of America timed the bonuses in such a way as to force taxpayers to pay for them through the deal funding." The Wall Street Journal reported that Bank of America had a private bonus agreement with Merrill that would have allowed for bonus payments of $5.8 billion. Cuomo has filed fraud charges against Bank of America for not revealing to its shareholders the extent of Merrill Lynch losses and for misleading the federal government in order to get the additional $20 billion in bailout money. Cuomo called Bank of America's behavior "just egregious and reprehensible." The Securities and Exchange Commission (SEC) sued Bank of America for not disclosing to its shareholders before they voted to approve the acquisition the extent of Merrill Lynch's losses and the $3.6 billion accelerated payment of bonuses. District court Judge Jed Rakoff refused to approve the original $33 million settlement agreed to by the SEC and Bank of America, and he reluctantly approved it only after the penalty was increased to $150 million. In reviewing the settlement, Rakoff harshly criticized the SEC for being too lenient, saying Bank of America's punishment was ""half-baked justice at best." Rakoff expressed concern that the SEC settlement was unlikely to dissuade other corporate executives from doing the same thing, since the settlement involved "very modest punitive, compensatory, and remedial measures that are neither directed at the specific individuals responsible for the nondisclosures nor appear likely to have more than a very modest impact on corporate practices or victim compensation." The judge stated that the settlement "penalizes the shareholders for what was, in effect if not in intent, a fraud by management on the shareholders." In 1975, the SEC's trading and markets division ruled that investment banks must maintain a debt-to-net capital ratio of less than 12 to 1. In 2004, following extensive lobbying by the investment banks, the SEC under chairman Christopher Cox authorized five investment banks to develop their own net capital requirements. This enabled investment banks to push borrowing ratios to as high as 40 to 1. These five investment banks were Goldman Sachs, Morgan Stanley, Lehman Brothers, Bear Stearns, and Merrill Lynch. This very high debt-to-reserves helped lead to the financial crisis of 2008 by weakening the ability of these institutions to recover from losses incurred when the risky CDO and CDS bets failed. Lee A. Pickard, who had been Director of the SEC's Division of Market Regulation when the 1975 12-1 rule was ordered, said of the change, "The SEC modification in 2004 is the primary reason for all of the losses that have occurred." At the time of its purchase by Bank of America, Merrill Lynch was leveraged at a ratio of 35.5 to 1. The Office of the Special Inspector General for the Troubled Asset Relief Program (SIGTARP) has sharply criticized the handling of the bailout of insurance giant AIG. In a November 2009 report, SIGTARP concluded that "the very design of the federal assistance to AIG" meant that "tens of billions of dollars of Government money was funneled inexorably and directly to AIG's counterparties." According to SIGTARP, "by providing AIG with the capital to make these payments, Federal Reserve officials provided AIG's counterparties with tens of billions of dollars they likely would not have received had AIG gone into bankruptcy." Federal Reserve officials refused to use their influence to get the banks to take some losses on their AIG deals, although they knew that their $85 billion bailout of AIG would immediately be used to pay off AIG counterparties and not to restore the viability of the insurance company. In calculating the ultimate costs to taxpayers of bailing out the banks, SIGTARP argues that the bailout of AIG should be included. Bank of America received $45 billion in direct government aid from the TARP program, and a further $118 billion worth of guarantees against bad assets. After receiving government funds, Bank of America continued to spend millions of dollars to lobby Congress, including to "fend off restrictions on executive compensation, home mortgage lending and credit card fees" as well as in opposition to the Consumer Financial Protection Agency. They also hosted efforts to defeat the "Employee Free Choice Act." Bank of America, together with Citibank and JPMorgan Chase, hold sixty percent of credit card balances in the US. "Card Game", a joint investigation by Frontline and the New York Times, found that deregulation of consumer lending had permitted industry practices that trapped many credit card holders in an endless cycle of debt. Credit card debt contributed to the housing crisis as homeowners were refinancing their homes in order to pay off accumulated credit card balances. The most lucrative clients for credit card companies are those who tend to be late on their payments. In an interview for the Frontline investigation, Professor Elizabeth Warren commented: "This is one of the dark secrets in this industry. People who are operating closer to the margin, those are the people who get trapped. Those are the people who produce the enormous revenues in the system." Lack of fair disclosure was highlighted in the Frontline investigation as a serious problem with credit card promotions. Using a Bank of America credit card application advertizing a "0% APR" as an example, Frontline asked a credit card industry executive to figure out what interest rate he would actually pay. Even after reading the fine print, the expert said he would not know the rate he would pay until the card was approved. Cardhub.com evaluated Bank of America and other credit card companies in terms of their fees as of June 2010, available here. Bank tellers at Bank of America, who did not "play a role in the economic crisis," receive a median wage of $10.73/hour, or $22,328 annually. In contrast, former CEO Ken Lewis' pay for 2007-2008 was $34.8 million, or 779 times the median teller wage. Investment bankers, some of the same ones that worked at Merrill Lynch in 2008 when it lost $27.6 billion and had to be rescued with a taxpayer bailout, may be granted the same bonuses in 2010 by Bank of America as they made in 2007. By repaying its government bailout in December 2010, Bank of America escaped from the executive pay restrictions that the federal government had imposed as a condition of the bailout. Two former senior Merrill Lynch executives decided to join Bank of America once the pay restrictions had been lifted. The extravagant bonus system for executives and traders of recent years may have contributed to the financial crisis by encouraging high risk strategies, with taxpayers picking up the costs when these strategies failed. New York Attorney General Andrew Cuomo's office investigated Bank of America's compensation practices and discovered that, while in 2008 Bank of America net income fell to $4 billion from $14 billion, compensation stayed at $18 billion. An Ipsos poll in January 2010 revealed that 60 percent of those who responded said executive pay and compensation were among their top five economic concerns. 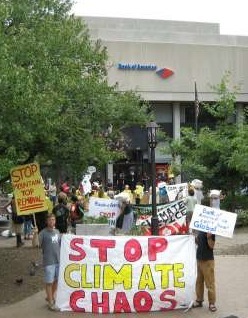 SCAN activists occupy a BofA branch in Asheville, NC, on Aug. 13, 2007. Bank of America is one of the largest investors in the coal sector and has lent billions of dollars to companies seeking to build new coal-fired power plants. The company's clients include the major players in the power and utility industry. Bank of America has also financed billions of dollars to companies that practice mountaintop removal coal mining, a technique that blasts off the tops of mountains to reach the underlying coal deposits. In December 2008, Bank of America announced a new investment policy to promote the "responsible use of coal." The policy involves phasing out financing for companies whose "predominant method of extracting coal is through mountain top removal" but increasing the financing of carbon capture and storage (carbon sequestration)." The former was praised by environmental groups but the latter was condemned. In March 2007, Bank of America announced a $20 billion initiative to "support the growth of environmentally sustainable business activity to address global climate changes." However, the Rainforest Action Network said that less than 2 percent of the assets were committed to fighting global warming and was still significantly invested in the coal industry. The March of Dimes has funneled millions into animal testing on primates, rats, mice, cats, dogs, rabbits, pigs, sheep, guinea pigs and opossums. They include nicotine, alcohol and cocaine addiction experiments; sensory deprivation and transplanting organs from one species to another. Bank of America is a corporate donor to March of Dimes. See also March of Dimes. Jack O. Bovender, Jr., Lead Independent Director; and Chief Executive Officer, HCA Inc.
Linda P. Hudson, Chairman and CEO, The Cardea Group, and former President and CEO, BAE Systems Inc.
Monica C. Lozano, Chair of the Board, US Hispanic Media Inc.
Lionel L. Nowell, III, Former Senior Vice President and Treasurer of PepsiCo, Inc.
D. Paul Jones, Jr., (67) - Former Chairman, CEO & President, Compass Bancshares, Inc. According to The Wall Street Journal, several major banks including Bank of America and Citigroup announced in early 2015 that they had to "cut the pools of bonus money set aside for traders and other employees" after unexpectedly weak performance in the fourth quarter of 2014. "At Bank of America, the Charlotte, N.C.-based lender recently moved to shrink its bonus pool earmarked for investment-banking and securities employees after its own lackluster December, people familiar with the matter said." Bank of America reportedly cut its bonus pool by 10 percent from the previous year. The Charlotte Observer reported that Bank of America's bonuses rose for 2013: "CEO Brian Moynihan was awarded $14 million for his performance last year, a 17 percent increase from the year before, the bank disclosed last week. His six top executives, four of whom are based in Charlotte, all got bigger stock bonuses than last year as well." The report noted that bonuses typically ranged from the the low six figures for associate bankers, to between $400,000 and $600,000 at the managing director level, to the multi-million dollar bonuses of investment bankers at the highest levels. According to Bloomberg News, Bank of America paid out $4.4 billion in bonuses in 2009, an average of a $400,000 bonus per person. Approximately 95 percent of this bonus payout was said to be paid as stock vesting over three years. Bank of America paid $3.3 billion in bonuses to executives and employees in 2008 while earning $4 billion after being a recipient of TARP bailout funds of $45 billion, according to a report by the Attorney General of New York State. Top four recipients received a combined $64.01 million. The next four received $36.85 million. The next six received $31.39 million. In addition, Bank of America purchased Merrill Lynch in 2008. According to the report by the New York Attorney General, Merrill Lynch paid $3.6 billion in bonuses to executives and employees while losing $27.6 billion after being a recipient of TARP bailout funds of $10 billion. Top four recipients received a combined $121 million. The next four received: a combined $62 million. The next six received: a combined $66 million. In 2014 Bank of America reported $2,908,528 in federal political contributions, of which 35 percent went to Democrats and 59 percent to Republicans. Forty-nine members of Congress reported having shares in Bank of America. Shane Osborn (R-NE): $100,738. Osborn was a candidate for Nebraska's open Senate seat and had been supported by FreedomWorks early in the race. James H. Hance Jr., then Vice Chair of Bank of America, was a Bush Ranger, having raised at least $200,000 for Bush in the 2004 presidential election. Two more Bush Rangers in the top leadership were Charles M. Cawley, Ex-Chief Executive Officer of MBNA, and Lance Loring Weaver, Executive Vice Chair of MBNA. Bank of America gave $1,167,222 to federal candidates in the 2005-2006 election period through its three political action committees -- 34 percent to Democrats, 65 percent to Republicans, and 1 percent to those in other parties. Bank of American gave a total of nearly $11.3 million in campaign contributions from 1998 to 2008. Bank of America reported $2,730,000 in lobbying expenses for 2014. $240,000 of this went to the firm Smith-Free Group. Bank of America's own registered lobbyists for 2014 were James F. Carlisle, John E. Collingwood, Edward Jeffrey Hill, and Darrell Minott. Its lobbyists with Smith-Free Group, all of whom are "revolvers" who had previously worked for government, were Andrew Barbour, Jon Deuser, and Robert Hickmott. Banking: S.2588, Cyber Information Sharing Act of 2014, issues related to cybersecurity; HR614, American Discoveries and American Jobs Commission Act, issues related to cybersecurity; S1353, Cybersecurity Enhancement Act of 2014, issues related to cybersecurity; S2521, Federal Information Security Modernization Act, issues related to cybersecurity; S2519, National Cybersecurity Protection Act of 2014, issues related to cybersecurity; HR992, S474, Swaps Regulatory Improvement Act, issues related to derivatives; HR5016, Financial Services and General Government Appropriations Act, issues related to derivatives; HR5421, Financial Institution Bankruptcy Act of 2014, issues regarding Chapter 14 bankruptcy; HR3711, S1282, 21st Century Glass-Steagall Act of 2013, issues related to Glass-Steagall; HR624, Cyber Intelligence Sharing and Protection Act, issues regarding cyber security; S798, Terminating Bailouts for Taxpayer Fairness Act of 2013, issues regarding bank capital; General issues regarding data security; General issues related to privacy; General issues related to interchange; General issues related to Dodd-Frank Act. Finance: HR4510, S2270, Insurance Capital Standards Clarification Act of 2014, issues related to collateralized loan obligations; HR5461, To clarify the application of certain leverage and risk based requirements under the Dodd-Frank Wall Street Reform and Consumer Protection Act, issues related to collateralized loan obligations; HR3547, Consolidated Appropriations Act, issues regarding Dodd-Frank Act section 716. Insurance: HR508, Terrorism Risk Insurance Act of 2002 Reauthorization Act of 2013, issues regarding terrorism insurance; HR478, E-Verify Modernization Act of 2013, issues regarding terrorism insurance; HR2146, Terrorism Risk Insurance Program Reauthorization Act of 2013, issues regarding terrorism insurance; S2244, Terrorism Risk Insurance Program Reauthorization Act of 2014, issues regarding terrorism insurance. Post Office: S1486, Postal Reform Act of 2014, general issues regarding postal reform pricing and oversight. Retirement: General issues related to fiduciary standard; General issues related to hybrid retirement plans. Tax: HR4429, Permanent Active Financing Exception Act of 2014, issues related to Subpart F active financing exception; HR5771, Tax Increase Prevention Act of 2014, issues related to Subpart F active financing exception; General issues regarding international tax reform; General issues related to low income housing tax credit; General issues regarding corporate tax reform. According to the Center for Responsive Politics, Bank of America's total lobbying expenditures for 2009 were $3,570,000. Bank of American spent a total of over $28.6 million in lobbying expenditures in the decade from 1998 to 2008. In 2008 Bank of America led the list of TARP recipients in political contributions and lobbying, spending $14.5 million -- $5,752,630 in political contributions and $8,790,000 on lobbying. The company spent $3,366,014 on lobbying in 2006. $1,380,000 went to eight outside lobbying firms with the remainder being spent using in-house lobbyists. Lobbying firms included Quinn Gillespie & Associates and Covington & Burling. "Profile: Bank of America", Co-op America, accessed December 2007. "Big Bank Profile: Bank of America", Service Employees International Union, accessed October 2009. Matt Taibbi, "Bank of America: Too Crooked to Fail", Rolling Stone, March 14, 2012. Sold Out - How Wall Street and Washington Betrayed America, Consumer Education Foundation, March, 2009. ↑ "The Banker top 1000," The Financial Times, June 30, 2010. ↑ U.S. Federal Reserve, "To 50 Bank Holding Companies," government website, accessed February 20, 2015. ↑ Dakin Campbell and Hugh Son, "Wells Fargo Dominates Home Lending as BofA Retreats: Mortgages," Bloomberg, May 3, 2012. ↑ "Merrill, UBS Sued by Schwab Over Mortgage-Backed Securities," Bloomberg BusinessWeek, July 14, 2010. ↑ Bank of America, "2013 10-K," SEC filing, February 24, 2014, accessed February 2015. ↑ "Bank of America and Citi: Closed for the Climate's Sake" nickengelfried, It's Getting Hot in Here, March 1, 2011. ↑ 11.0 11.1 11.2 United States Department of Justice, "Bank of America to Pay $16.65 Billion in Historic Justice Department Settlement for Financial Fraud Leading up to and During the Financial Crisis," press release, August 21, 2014. ↑ Peter Eavis and Michael Corkery, "Bank of America's $16 Billion Mortgage Settlement Less Painful Than It Looks," The New York Times, August 21, 2014. ↑ "Bank of America's Mortgage Record Takes a Hit; Report Shows Mortgage-Backed Securities Issued in 2007 Among the Industry's Worst Performers." The Globe and Mail. February 25, 2009. ↑ "Banks' Self-Dealing Super-Charged Financial Crisis," ProPublica. August 26, 2010. ↑ "Hope rises for real financial reform," Washington Post. April 21, 2010. ↑ Frank Partnoy, F.I.A.S.C.O – Blood in the Water on Wall Street, 2009, pgs. 267-268. ↑ "Brian T. Moynihan, CEO & President, Bank of America "Testimony to Financial Crisis Inquiry Commission (FCIC),", January 13, 2010. ↑ "Road to Stability – Targeted Investment Program," US Treasury Department. ↑ "Government Interventions in Response to Financial Turmoil," Congressional Research Service. February 1, 2010. p.37. ↑ "December Oversight Report - Taking Stock: What Has the Troubled Asset Relief Program Achieved?" Congressional Oversight Panel. December 2009. ↑ "New York Times Profile: Bank of America,"
↑ "New York Times Profile: Countrywide Financial Corporation"
↑ Simon Johnson, James Kwak, Thirteen Bankers, 2010, p. 12. ↑ "Markets Show Faith in Bank of America-Merrill Merger," Wall Street Journal. December 5, 2008. ↑ 42.0 42.1 42.2 Simon Johnson, James Kwak, Thirteen Bankers, 2010, p.204. ↑ "Countrywide Financial Corporation," New York Times profile, accessed 2010. ↑ 45.0 45.1 E. Scott Reckard, "Countrywide sued by state over lending," Los Angeles Times, June 26, 2008. ↑ Nomi Prins, It Takes a Pillage, 2009, p. 153. ↑ Stephen Bernard, "Bank of America Rebrands Mortgage Operations," The Seattle Times, April 27, 2009. ↑ Craig Torres, Bob Ivry, and Scott Lanman, "Fed Reveals Bear Stearns Assets Swallowed to Get JP Morgan to Rescue Firm," Bloomberg, April 1, 2010. ↑ "Countrywide Financial Corporation, New York Times profile, accessed 2010. ↑ Stephanie Armour, "Countrywide to pay $600 million to settle lawsuits, USA Today, August 6, 2010. ↑ Illinois State Attorney General's Office, "Madigan Sues Countrywide for Discrimination Against African American and Latino Borrowers - Alleges African American and Latino Homeowners Paid More for Their Mortgages than They Should Have," press release, June 29, 2010. ↑ Charlie Savage, "Countrywide Will Settle a Bias Suit," The New York Times, December 22, 2011. ↑ "New York Times Profiles: Merrill Lynch & Company Inc."
↑ slide 20, Professor Andrei Shleifer. The Financial Crisis and The Future of Capitalism, Harvard Economics Dept., June 2009. ↑ "Factors Affecting Efforts to Limit Payments to AIG Counterparties," Office of the Special Inspector General for the Troubled Asset Relief Program. November 17, 2009. ↑ "What's Haunting Timothy Geithner?" Newsweek. January 8, 2010. ↑ $45 billion figure from Bailout Recipients Pro Publica, updated September 29, 2009. ↑ $118 billion figure from Bank of America bail-out agreed, BBC, January 16, 2009. ↑ Sam Stein, Bailout Recipients Hosted Call To Defeat Key Labor Bill, Huffington Post, January 27, 2009. ↑ "The Card Game," PBS Frontline, July 2009. ↑ Pew Health Center, "Two Steps Forward - After the Credit CARD Act, Credit Cards Are Safer and More Transparent — But Challenges Remain," organizational report, July 2010. ↑ Service Employees International Union, Profile of Bank of America, union website, accessed 2010. ↑ Dan Fitzpatrick, For Bank of America Investment Bankers, Bonuses Likely Close to 2007, Wall Street Journal, January 8, 2010. ↑ Ieva M. Augstums, Bank of America Hires 2 Former Merrill Executives, Associated Press, February 22, 2010. ↑ April H. Lee, Bonuses in financial sector to increase slightly this year, MarketWatch, August 12, 2010. ↑ Stephen Foley, Obama talks tough on day Goldman reveals bonus pot, The Independent, January 22, 2010. ↑ "FleetBoston named in lawsuit seeking reparations for slavery", Associated Press, March 26, 2002. ↑ Bank of America, "Executive Management", organizational website, accessed February 20, 2015. ↑ Bank of America, 2014 Proxy Statement, organizational document, 2014. ↑ Bank of America Investor Relations, "Board of Directors", organizational website, accessed February 20, 2015. ↑ Justin Baer and Matt Turner, "Big Banks Look Set to Trim Bonuses," Wall Street Journal, January 9, 2015. Accessed February 25, 2015. ↑ Julia La Roche, "Bank Of America Is Cutting Its Trader Bonus Pool Up To 10%," Business Insider, January 29, 2015. ↑ Andrew Dunn, "Bank bonuses rise, but not to boom-time levels," Charlotte Observer, February 24, 2014. ↑ David Milenberg, Bank of America Said to Pay Average Bonus of $400,000, "Bloomberg," February 3, 2010. ↑ Andrew M. Cuomo, No Rhyme or Reason, report by the Attorney General of New York, retrieved October 4, 2009. ↑ Michael Corkery, Bank of America: The Cuomo Report's Bonus Breakdown, "Deal Journal," Wall Street Journal, July 30, 2009. ↑ Michael Corkery, Merrill Lynch: The Cuomo Report's Bonus Breakdown, "Deal Journal," Wall Street Journal, July 30, 2009. ↑ 97.0 97.1 Center for Responsive Politics, Bank of America, political contributions summary, OpenSecrets.org database, accessed February 25, 2015. ↑ James Hohmann, "FreedomWorks dumps Shane Osborn, backs Ben Sasse," Politico, March 28, 2014. ↑ Center for Responsive Politics, TARP Recipients Paid Out $114 Million for Politicking Last Year, OpenSecrets,org database, February 4, 2009. ↑ Source: Center for Responsive Politics. Campaign contribution totals accessed February 2009. Individual recipient numbers do not include the 4th Quarter of 2008. ↑ Texans for Public Justice, "Pioneers and Rangers," organizational research page, accessed August 2007. ↑ PAC #C00043489, Open Secrets, accessed July 2007. ↑ PAC #C00252866, Open Secrets, accessed July 2007. ↑ PAC #C00364778, Open Secrets, accessed July 2007. ↑ 105.0 105.1 Robert Weissman and Harry Rosenfeld, Sold Out: How Wall Street and Washington Betrayed America, Wall Street Watch, March 2009, p. 17. ↑ 106.0 106.1 106.2 106.3 Center for Responsive Politics, Bank of America, OpenSecrets.org lobbying profile, accessed February 25, 2015. ↑ Center for Responsive Politics, "Bank of America," accessed June 16, 2010. ↑ Robert Weissman and Harry Rosenfeld, Sold Out: How Wall Street and Washington Betrayed America, Wall Street Watch, March 2009, p. 17. ↑ Center for Responsive Politics, TARP Recipients Paid Out $114 Million for Politicking Last Year, OpenSecrets.org, Feb. 4, 2009. ↑ Center for Responsive Politics, Bank of America lobbying expenses, OpenSecrets.org, accessed October 2007. This page was last edited on 27 September 2017, at 22:52.